On 10 October, over two million Liberians will vote for a new president. 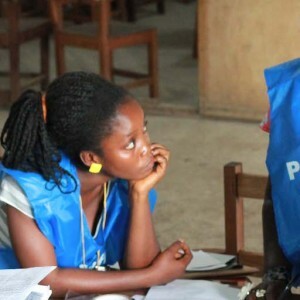 As historic as the election of Africa’s sole female president was, so is Liberia’s first presidential transition through democractic elections since the end of the 14-year civil war in 2003. The 20 contenders vying to replace President Ellen Johnson Sirleaf echo the campaign pledges she made on the trail in 2005 to end corruption and promote development. However, none of them share the type of career in both national and international public service that initially lent her credibility. Unfortunately Johnson Sirleaf’s inability to effectively tackle corruption, improve livelihoods and promote national reconciliation has depleted the ruling Unity Party’s political capital, while making it harder for the other candidates to campaign on credentials and promises. When Johnson Sirleaf took office in 2006 at age 67, she exhorted Liberians to roll up their sleeves and join her in the task of post-war reconstruction. She prioritised four areas – peace and security; economic revitalisation and consolidation; governance and the rule of law; and infrastructural renovation. These have become the yardsticks by which her presidency has been judged. The presence of the United Nations Mission in Liberia (UNMIL) with about 15 000 UN military personnel and 1 115 UN police officers gave her the security guarantees to embark on her reconstruction agenda. Economically, she renegotiated Liberia’s Governance and Economic Management Assistance Program (GEMAP) with its international partners. Implemented between 2006 and 2010, GEMAP sought to help Liberia improve overall economic governance by institutionalising financial and asset management policies and procedures, and containing corruption. However, caught between the exigencies of an international community whose reconstruction support was primordial and a national community with great post-war expectations, Johnson Sirleaf pursued economic reconstruction largely at the expense of national reconciliation. Her commitments to growth through economic liberalisation in exchange for debt forgiveness and Liberia’s inclusion in the heavily indebted poor countries (HIPC) initiative contributed to the exclusion of communities’ perspectives in the negotiation of natural resource concession agreements. The services and industrial agriculture sectors – rice, rubber, cassava and palm oil – have averaged contributions of about 72% annually to Liberia’s gross domestic product over the past decade. Together with natural resources – the mining and forestry sectors – they provide the state with much-needed foreign direct investment, despite mining creating fewer jobs. While all these sectors keep the economy afloat, they have also triggered land tenure and labour conflicts with local communities, with Johnson Sirleaf’s government often siding with the concession operators ostensibly to restore law and order. This extractive focus of economic reconstruction has been accompanied by a post-war transition to overt forms of privilege, patronage and corruption in keeping with Liberia’s past. During her tenure, corruption scandals dogged managers of Liberia’s state-owned enterprises and ministers, and ensnared public officials involved in the negotiation and attribution of concessions. Successful prosecution of these white-collar offences has remained elusive. During her last State of the Republic message in January, Johnson Sirleaf acknowledged that corruption and reconciliation were two areas that had posed enduring challenges to her administration. Corruption continues to undermine state-society relations and the consolidation of Liberia’s post-war recovery. The lack of political will to effectively prosecute past and present crimes sows new seeds of socio-economic discord, especially given Johnson Sirleaf’s reluctance to pursue meaningful national reconciliation. The Truth and Reconciliation Commission (TRC) was negotiated into the 2003 Accra Comprehensive Peace Agreement as a cornerstone of the national reconciliation process. In its 2009 report, the TRC recommended that 98 individuals be prosecuted for violations of international humanitarian law and war crimes committed during the civil war. It recommended an additional 50 – including Johnson Sirleaf – be barred from public office for 30 years for supporting various warring factions. To establish Liberia’s current tenuous peace, Johnson Sirleaf chose stability over accountability, advocating for restorative over retributive justice. In the process, national reconciliation was eclipsed. Johnson Sirleaf won the Nobel Peace Prize in October 2011 as she stood for re-election in November of that year. Meanwhile the TRC’s recommendations have been successfully challenged in Liberia’s courts, raising questions about the ownership and relevance of the exercise. The complexity and scale of the challenges inherited from the civil war and the dysfunctional pre-war state were always going to pose long-term difficulties to national reconciliation and institution building. However, Johnson Sirleaf’s approach to addressing issues led to a flourishing parallel bureaucracy with myriad commissions whose mandates often overlapped with those of ministerial departments. Gains made in infrastructure expansion and macroeconomic stabilisation through Johnson Sirleaf’s ambitious reform agenda were further delayed by the 2014 Ebola outbreak that stalled Liberia’s fledgling post-war economy. These gains remain vulnerable to reversal as long as state-society relations remain fragile. She also leaves a trail of security, governance and economic loose ends in her wake. Even Liberia’s new constitution, the product of an extensive national consultation process, remains incomplete. Liberia’s next president will need to prioritise an inclusive, meaningful and comprehensive national reconciliation process that cuts across social, economic and political programmes. Unfortunately voters don’t have much choice with the group of 20 presidential candidates. With indistinguishable political programmes and a lack of concrete road maps, contenders are building geographical alliances rather than selling political visions. This might get them to the run-off, but will hardly provide a mandate to govern over a nation doubtful of presidential promises. And as the international community scales down its support for Liberia’s post-war state-building project, the new president’s job is going to be even harder.